MONTREAL, Que. 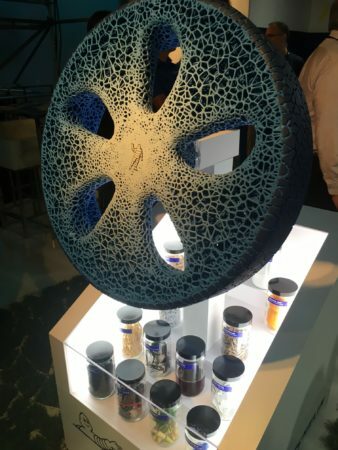 – Michelin has revealed a futuristic airless concept tire constructed of biosourced materials, which can change tread designs on demand. The tire, which the company says could be viable within 10-15 years, would completely change how fleets use tires. The integrated wheel and tire is made of everyday materials, including orange peel, cardboard, used metal, molasses, and other waste material. But perhaps most fascinating, the rechargeable tire can change tread design when plugged into a device that uses 3D printing to quickly apply the required tread. In this way, the Vision tire could go from summer to winter tread, or even be optimized for the route the truck will be traveling. Michelin showed the tire for the first time at its Movin’ On conference on sustainable transportation and mobility in Montreal, Que. The Michelin Vision concept tire is made from biosourced materials and can change tread designs using a 3D printer-style charger. Gettys acknowledged the tire is still a concept, yet he said it’s one that’s realistic. In the absence of air, the Vision tire uses an interior alveolar architecture that can support the weight of the vehicle and its load. Its design isn’t susceptible to explosions or blowouts, Michelin claims. It’s also connected. Gettys said sensors provide real-time information about the tire’s condition. The four key attributes that the Vision tire offer are: an organic design, made from biosourced and biodegradable materials; a rechargeable tread printed in 3D; an airless design; and connectivity. “By offering a mobility solution that combines a unique tire, services and materials, Michelin is unveiling an innovation that is inspired by nature, is perfectly integrated into the framework of a circular economy and embodies the Group’s vision of the sustainable mobility of the future,” Michelin announced at Movin’ On.